Being an artist, I can actually say “Come up and see my Etchings”, and mean actual etchings. Arthur has decided to Guard them this weekend. He needs to get guarding in at the weekend at the moment since we still have a house full of plumbers on work days, but he feels if he guards them well enough when he has the chance they will then be safe for the rest of the week. 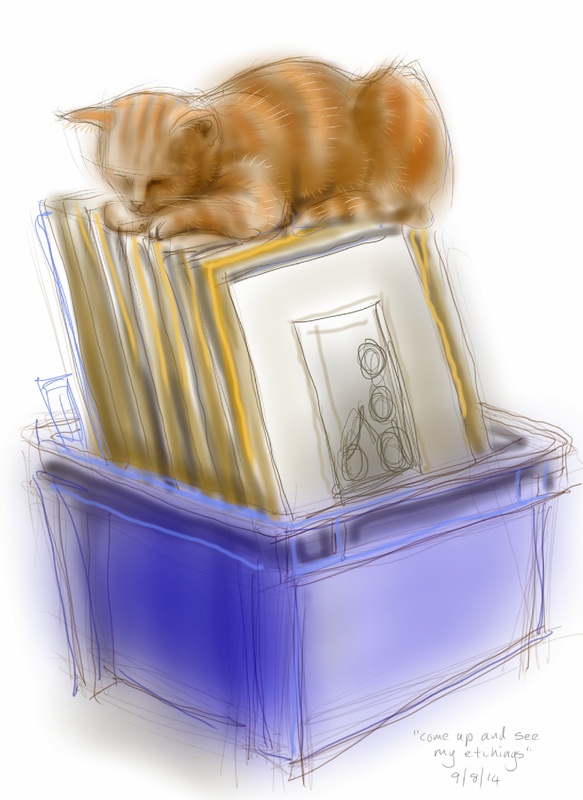 This entry was posted in Cats and tagged art, arthur cat, cat drawing, cat sitting, digital painting, digital sketch, drawing, ginger cat, guarding, illustration on August 10, 2014 by Nancy Farmer. I have a printer friend who genuinely used that line to a young lady on their first date and yes, dear reader, he married her!